One of my idea sketches became a full page interior illustration. Below has the three different version of idea sketches. Idea 01: Have some business people (the new data service providers) running and a Bloomberg terminal being smashed beneath their feet. 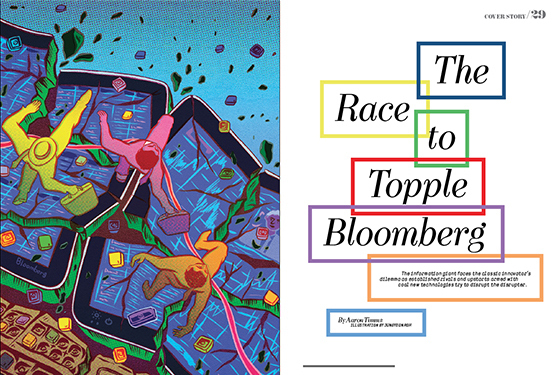 Their racing to be the winner, crushing Bloomberg beneath them. Idea 02: The Bloomberg Tower, looking like a castle, with the new upstart data service providers trying to scale a wall and get to the top of the building. Another is trying to pull it down with ropes. There are people in the Bloomberg Tower defending it. Idea 03: Bloomberg as a giant data crunching robot, boxing another smaller machine and being attacked by even smaller machines who are trying to topple it. Posted on February 8, 2014 by Jungyeon Roh. This entry was posted in cover, Editorial, Magazine and tagged Bloomberg, Bloomberg Terminal, institutional investors. Bookmark the permalink.